In this study from Acts 17, children will learn that GOD is ONE. 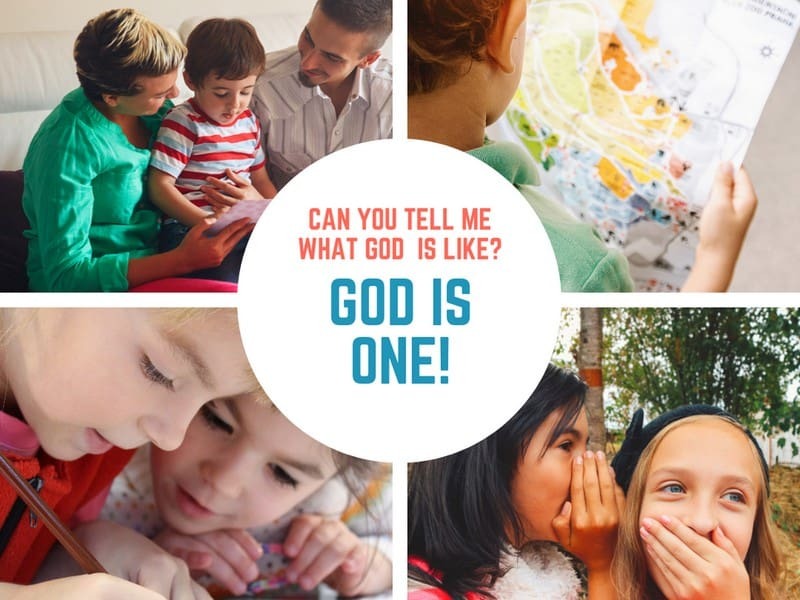 This is lesson 27 of 42 in our study on the Attributes of God called “Can you tell me what God is like?” Visit the series index to view all the lessons and get more ideas for using this curriculum in your children’s ministry. Take the time to go through all 26 of the attributes we’ve already learned in this study. Either read the attribute and have the kids do the motion, or read the definition and have the kids tell you the definition. Say: “I just read a list of 26 truths about God. Does that mean there are 26 gods??? One who is Omnipotent and One who is love and One who is Holy? No, obviously not and I know that none of you thought that. Sometimes people like to say things like ‘my God is loving, but He’s not a judge,’ but when people are saying things like that they are forgetting our truth for today. They are forgetting that God is ONE. God is all of the attributes that we’ve talked about so far this year and all the truths we’ll talk about the rest of the year and so much more. In order to understand who God is, we need to have a big picture of God. Forgetting one or two of the truths of God would be like putting together a puzzle and leaving out a couple of the pieces, we wouldn’t have a complete picture of God and we wouldn’t be worshipping the true God. Tell the kids that you want to walk them through a story that should help them understand more about the truth that God is One. Paul was in Athens and while he was there he was upset because the city was full of statues to false gods. Paul met with people and tried to explain to them that there is only One true God. One day Paul was invited to come speak in the Areopagus (the place where all the men in town met to talk about important things). This is what he told them about their false gods. After going through the passage, have the kids help you make a list of the truths about the One true God that Paul taught the people. Some of the things they should notice are: He wasn’t made by people, God made all people, God will judge the world, God raised Jesus from the dead, God makes us live everyday. Briefly explain that when we say God is One, we are saying two things: (1) there is only One God and (2) there is unity in the trinity. God the Father, Jesus and the Spirit are One God, they are 3 in one. Since motions & actions help kids remember, choose an action for ONE. A good motion might be to hold up 1 finger. Explain that to help us remember this truth that we’re going to make something to illustrate the truth. In the middle of a large piece of cardstock or poster board, write the word God. There should be at least as much space as the word God on all 4 sides of the word. Draw a circle around the word God. Then draw 6 or 7 lines from the edge of the paper to the circle like rays coming out of the circle. This should divide the blank areas of the paper into 7 or 8 spaces. Have kids tell you one truth about God to write in each space. Carefully cut down the lines to the edge of the circle. Take turns folding down one of the pieces of your page and asking, “Can God be _____, and______, and ______ and ______ without being _______. ?” (fill in the first blanks with truths that are visible on your page and the last one with the truth you folded down. The point is that God is One and He is all of these truths….He is Almighty and Omniscient. He is compassionate and the judge, etc. Read the memory verse (Deuteronomy 6:4) a few times together. Talk through John 14:6 and how just as there is One God, and God is One (meaning that God the Father, Jesus and the Spirit are One), that the Bible is also equally clear on the truth that there is ONE way for sinful man to be reconciled to God and that is through Jesus. Remind the kids why we are separated from God (because of our sin) and have them repeat after you – One God and One way. Use 1 Timothy 2:5 to support this argument. Talk about some of the other ways that some people try to get to God – other religions, being really good, coming to church. Explain that the Bible is really clear when it tells us that Jesus is the only way to God because Jesus died to pay the price for our sin. Give each child a blank piece of paper provide markers or colored pencils. Encourage them to write the word one somewhere on the paper and then write or draw something to help them remember this attribute of God. They could write the definition for one or the memory verse or they could illustrate the story that they heard this morning. After a few minutes, bring the group back together and give kids time to share what they have drawn or written. Pray that the kids in the group would come to know God more and more each week through this study and that they would remember that all of us are sinners who need to be saved and that they would turn to this good God for salvation. Thank God for giving us the Bible where we can learn about who He is and what He is like. Ask God to continue to teach us to worship Him the way He alone deserves to be worshipped. Filed Under: Acts, Lesson Plans, Uncategorized, What is God Like? Tony Kummer (Editor) reviewed & updated this page on : April 8, 2019 at 10:17 am. All our content is peer reviewed by our readers, simply leave a comment on any post suggest an update.